There is a house in our neighborhood that hasn't been much to write home about. It wasn't exactly pretty, in fact, it was downright ugly. That was until recently. The house went up for sale and when the house changed ownership things began to change. First we noticed the old carpet had been ripped out and carried to the roadside. Then there was evidence of floors being refinished. We could tell the walls were being painted inside as well. Still the house looked virtually the same on the outside. Then the carpenter moved outside. The old, dated wrought-iron rails were pulled down and new, modern wooden rails and posts were put in their place. The shutters were taken down and painted. But the biggest change came only this week. My husband watched it in stages, but I only saw the finished product as we drove by today. The old, monochromatic, red brick had been painted. In it's place was a crisp cream colored house. Sharp and fresh looking, the whole house looked new. What had begun as an inward transformation ended up as a total transformation. What was once an outdated, ugly old house now looks fresh and cute. The house has been redeemed. I know how that house feels. I've been redeemed, too. Just as the house in our neighborhood is no longer an ugly, outdated house, we are no longer a sinful, wicked person. Our new being is "created in righteousness and true holiness" (Ephesians 4:24). Our every expectation should be that we should walk in and live in that righteousness and holiness by the power and strength of the Lord Jesus Christ. After all, would you expect the new owners of the house to sleep out on the old carpet by the side of the road? No, they will celebrate the beauty of the redeemed house and enjoy the glory of the work of the carpenter. In like manner we should live in a way that celebrates the beauty of the redemption of our souls and the glory of the work of our own Carpenter. unto eternal life by Jesus Christ our Lord." On the way home from work this morning I happened to see a squirrel digging up a nut of some sort he had hidden away earlier. He had buried nuts when they were plentiful for the time when he would be in need. Like the little squirrel, we should hide away nuggets of the Lord's truth in our hearts and minds so we can pull them out readily when we are in a moment of need. The truths of Scriptures are a comfort in moments of pain and suffering; they are a strength in times of weakness; they are a tool for use in prayer; they are an encouragement for the downtrodden; they are instruction for those in need of direction; they are reproof for those in error; they are the sword of the Spirit for those in battle; they are edification for the saints and a source of praise for the joyful. Whatever the situation, the Scriptures tell of the answer because the Scriptures are all about the One who is THE Answer. Whatever the need, the Scriptures describe the supply because they tell of the One who supplies "all your need according to His riches in Christ Jesus." and every one of Thy righteous judgments endureth for ever." Last night we were traveling to a store a few miles from our house. As we went down the road I was looking out the window and began to marvel at the wonder of our eyesight. Moving my focus from one thing to another my eyes instantaneously adjusted and refocused so that I could see. I remember one moment that wasn't the case. I had always prided myself on my good vision. Then in my forties, my close vision began to leave me. I didn't grieve too much over that, I figured it was part of life. At least I still had great far vision! I adjusted by wearing monovision contacts -- a contact in one eye to see close up, while the other eye sees far away. That worked quite well for many years. Then one day I went to the ophthalmologist for a routine eye exam and contact prescription. As I looked at the eye chart the nurse projected onto the wall I casually commented, "Oh, you have a new eye chart." I'm sure she was trying to hide back a chuckle as she replied, "It isn't a new chart." Reality had not yet sunk it, "It must be, I could read all the lines on the old chart," I said. She put her hand on my shoulder, "It is the same chart." Then it hit me. It was the same chart, but my eyes weren't the same. I just couldn't see far away anymore. I left with a prescription for bifocal glasses and bifocal contacts. Unfortunately, I would still need the reading glasses. This time I was unhappy. It wasn't until I picked up my new glasses I realized how much my far vision had deteriorated. I think I drove my husband crazy that day. "Look, honey, I can read that sign!" "Look, I can see the leaves on that tree!" Everything I had been missing for at least a year or maybe two I now announced to him. Having worn glasses since he was about eight, it dawned on me after a while that he understood the wonders of corrective vision and I kept my joy to myself. We have other "eyes" besides those in our head. In the book of Ephesians the Apostle Paul prays for the Ephesians that the eyes of their understanding may be enlightened. This is the corrective vision of the heart we all require. We need the enlightenment which comes by way of the illumination of the Holy Spirit, the communion of fellow believers and discernment of the Scriptures in our hearts. The more these three are at work in our lives, the more we will "see" those things in our lives that we need to see, and the better we "see," the better we will live. according to the working of His mighty power,"
The Imperfect, Perfect Birth. . . Working in Labor & Delivery, I had have the privilege of being a part of almost 2800 deliveries over my 34 year career. This includes times when I was the patient's nurse, when I was the scrub nurse, when I was in the delivery helping other nurses and times when I actually delivered the babies. In my first five years as a nurse I worked in NICU and we attended all high risk deliveries. There is no way for me to know how many of those deliveries I attended during my NICU years. There is one delivery however, that I would have loved to witness, that I would love to know even a little more about. In five weeks we will celebrate the birth of the Lord Jesus, one of the most important events of human history andyet it has so little information actually revealed about it. Being an L&D nurse, I want details! I want video if it is available! Couples today spend the forty weeks of pregnancy planning the aspects of their child's birth. Every detail has to be exactly what they want it to be. They decide who will be with them for the big event. They bring in massive amounts of belongings and equipment for the baby, all bearing the new child's monogram, of course. Everything has to be perfect, everything new, sweet smelling and shiny. Contrast what we know of our Lord's birth. The newborn baby Jesus, instead of being placed in a sparkling new baby bed, was laid in a feeding trough for animals. The Lamb of God was placed were the lambs came to get their food. Instead of monogrammed onesies and day-gowns, our Lord was wrapped in swaddling clothes. The clothes of death were monogrammed with His purpose in going to the cross to purchase our salvation. Instead of a parade of family members to visit, the Lord Jesus was visited the night of His birth by a group of shepherds who came to worship the One who is the Good Shepherd, the Great Shepherd and the Chief Shepherd. It seems as if everything was wrong about our Lord's birth, but everything was, in fact, perfect. It was the perfect place, the perfect time and the perfect way for a God who values love and humility. Everything about His entrance into this world speaks to us of His heart. He is a meek and lowly, humble and loving God. When I was a teenager my parents took a vacation through the Smokey Mountains. My cousin of the same age and myself accompanied them. While traveling through some of the most beautiful scenery of our country my cousin and I slept in the backseat. Multiple attempts to wake us so we could view the glories outside our windows were futile. As young teenagers, we valued sleep more than vistas. We weren't able to awake to the beauties around us. The Apostle Paul told the Corinthians, "Awake to righteousness, and sin not;" (1 Corinthians 15:34.) It seems there are times in our lives we simply choose to remain asleep to righteousness. Just as my cousin and I just ignored the beautiful mountain vistas outside our windows, we choose to ignore even the choice of righteousness. Yet to do so seems to lead to the inevitable unrighteousness. There is no neutrality, we either walk in the spirit of life and true holiness or we walk after the flesh. We walk in the sleep of ignoring our walk with Christ or we walk in "newness of life." We have a choice and we have a choice each and every minute. The last minute is past, only this minute is alive unto us now. There is an old movie in which the hero must choose one cup among hundreds. The person before him chooses wrongly and is immediately annihilated. The Keeper of the cups states in the most droll manner, "He chose poorly." We too, like the hero in this movie, must make wise choices, only our choices have eternal consequences. Let us remember that each moment represents a choice to us to choose to awake unto righteousness or to walk after the flesh. Let us "choose wisely." choose you this day whom ye will serve. . .
. . .but as for me and my house, we will serve the LORD." Today is a day set aside by our nation to give thanks and we have so much for which to give thanks. 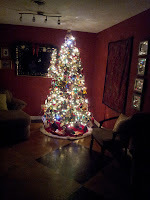 As I write this I can see the glow of Christmas lights from our tree in the corner. The smell of the turkey roasting in the oven fills the air. Everywhere I look, from the beagle sleeping peacefully at my feet, to the roof over my head speaks of bountiful blessings. Sometimes to realize how very blessed we are we have to look somewhere else. I read today that in 2011, 44% of Africans lived on $1.25 or less a day. I confess I have paid more than that for a cup of coffee before. That's only $456.25 a year. Sometimes we forget just how much we have to be thankful for. I had a stark reminder at 1a.m. I was sleeping soundly and blissfully, until a realization woke me, bolted me upright and shot me out of bed like a bullet out of a gun. 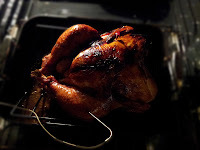 I have always cooked my turkeys as my mother did, and I have never had a bad turkey. I cook my turkey long, slow and low, through the night. In the morning, the thermometer wedged in his thigh shows he has reached a temperature safe to eat and he is a beautiful golden brown. The house is full of a glorious Thanksgiving aroma and the oven is free for the dressing and Spinach Madelaine which has to be cooked later. Only last night I forgot to put the turkey in the oven before I went to bed. At 1a.m. something, I choose to believe it was the Lord, woke me up with the remembrance the turkey was still sleeping in the refrigerator. Today I will be thankful for many things. . .my sweet best friend and husband, my wonderful children, my beautiful grandchildren, our special friends joining us around our table today and all our bountiful blessings. But I will also be thankful for that "still, small voice" that whispered at me in my sleep to wake me up and put the turkey in the oven. This is the way, walk ye in it, when ye turn to the right hand, and when ye turn to the left." Wearing the Smell. . . I spent most of yesterday in the kitchen cooking for Thanksgiving. Around midday, however, Glen and I left for our usual Tuesday services at a local retirement community and nursing home. I was sitting in the service as Glen was praying, and I noticed a very distinct aroma of garlic and onions emanating, not from the facility kitchen, but from my hair. The very last thing I had cooked before we left was the vegetables for our cornbread dressing, which is composed of onion, bell pepper, celery and garlic sauteed in olive oil. As I stood over the pan, my hair became infused with the fragrance of the vegetables. What a simple lesson we can learn in this. We pick up the attributes, the characteristics, sometimes even the actions of those persons, those things with which we immerse ourselves. If those around us have bitter, complaining attitudes, before long we will find the words of bitterness and complaint pouring out of our mouths as well, even as much as we dislike them. If those around us have mouths full of profanity, we may find those words popping into our brains to our dismay and for some it may be quite a struggle to keep them from popping out of our lips as well. If we are around those who have cheerful, kind attitudes, we will find that they naturally sweeten our own attitude more. While we cannot control everyone around us, it behooves us to choose our friends well, to seek those who love the Lord Jesus and seek His will in their lives. We should also strive to be those that others would want to choose as their friends, having that sweet, spirit which evidences the residence of the Holy Spirit in our hearts. Let Us Have. 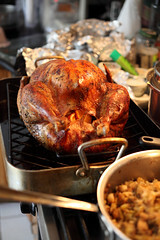 . .
On Thanksgiving Day each member of our family is allowed to choose a dish they would like that day. That being said, our menu doesn't vary much because everyone always wants the same thing. But if they wanted something different, all they'd have to do is ask. Our Thanksgiving menu turns out to be a pretty standard Thanksgiving Day meal considering the menu is open for requests. The one unusual item is more of a tradition than a request. Each year, while we are thanking the Lord for His amazing blessings to us, our rolls burn. We could blame that on the fact that we allow the preacher at the table to say the blessing, but we each suspect it is actually more because there is one person who prefers their rolls rather well-done. That's all I'm going to say about the roll situation except that almost each year they turn out a good deal too dark. Our "table" that the Lord sets for us is much like our Thanksgiving Day meal. He has allowed us to make choices in our lives and then He works those choices into His plans for our best. He could have made it so that we had no choice, but He didn't. He could have also make it so that we had to work and toil and strive for our salvation, but He didn't. Instead He gave us a free gift of grace that we only need to receive by faith. As the writer of Hebrews penned, "Wherefore we receiving a kingdom which cannot be moved, let us have grace, whereby we may serve God acceptably with reverence and godly fear:"(Hebrews 12:28.) So "let us have grace. . ." to begin our life with Him and to continue the wonderful blessing of a walk with the Lord Jesus. "Thanks be unto God for His unspeakable gift." Today we will put up our Christmas tree. Not so much because it is a matter of tradition to do it on this day, but because it is most convenient to do it today. I have to work Thursday, Friday and Saturday nights, and of course, I will be cooking much of tomorrow and Wednesday, so today is the day. I can remember as a young girl begging my father to go to the Christmas tree lots to pick out our tree. It didn't matter to me if it was cold or raining, but it did to him. He would find every excuse not to go. Of course, as a young girl I didn't understand being tired after working all day. I actually only remember my father moving quickly once in my life -- that was the afternoon Glen wanted to ask for my hand in marriage. Suddenly my father had errands to run that just couldn't wait and he was out of the house in a flash. But around Christmas? He was as slow as the day itself. Once we finally had made it to the lot and selected a tree, it wasn't as if it was going to be decorated anytime soon. My father was the only one allowed to put the lights on the tree and he was a perfectionist. It seemed like it took him forever to put those lights on the tree. Knowing my dad, it probably did take him forever! I don't ever recall seeing a wire on the trees when I was young, but then I was probably spending most of my time looking at the bottom of the tree where all the presents were piled. I enjoy putting up our tree, but I enjoy having it up even more. 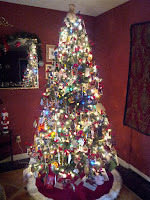 By the end of the day approximately 800 ornaments will be on our eight-foot tree, I will have consumed at least four or five cups of coffee and our living room will look like Christmas. 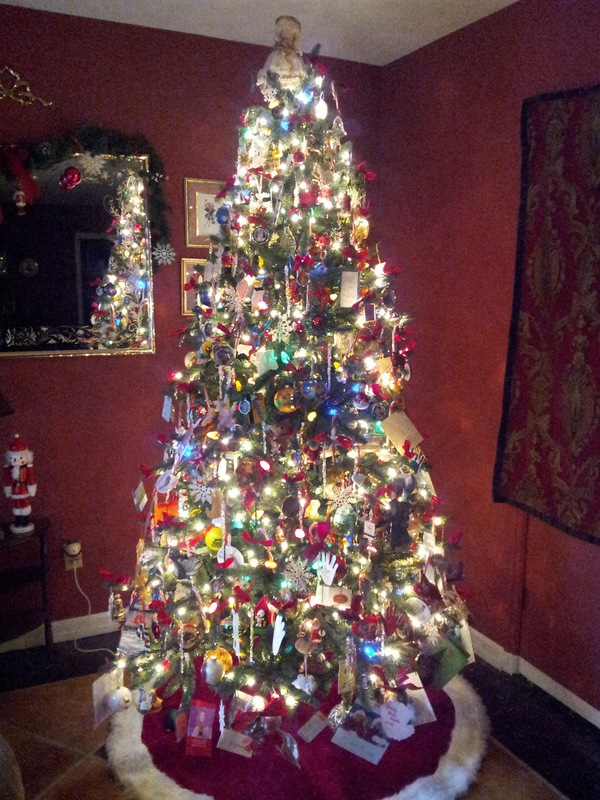 That Christmas tree smell will have to come from a spray or candle, our tree is not real. For years we had real trees -- I especially loved the Frasier Fir trees -- until I found out they were the reason I was sick each December. Now that I know I am allergic to most Christmas trees and am resigned to an artificial tree, December has become much easier. The garland around my mantle isn't real either. While it is easy to tell the garland isn't real, my tree can fool you at first. It's a pretty good fake tree even without all the lights and ornaments, but when covered with tons of shiny, colorful things to hide the fake limbs and branches, it starts to look fairly real. It's amazing how easily we can adapt to something artificial, to a "fake", when it seems to benefit us, isn't us? Let us make sure in our day to day lives that we are seeking the wisdom of the Lord in our judgments and that we are being, as our Lord said, "wise as serpents, and harmless as doves." When Glen and I were first married, he brought home a some books for us written by J.R.R. Tolkien, The Hobbit and The Lord of the Rings. We both enjoyed reading these fantasy stories of hobbits, dwarves, elves and men. For most of these creatures a sword was a very important thing. Aragorn, as rightful heir to the thrones of Arnor and Gondor, of course wielded the most powerful sword, but even little Frodo Baggins had a hobbit-sized sword, a dagger actually, that glowed blue in the presence of Orcs. There are important things to remember about swords. You must actually have it with you for it to be useful, and you must unsheathe it at the appropriate time. The same can be said for the "sword" we as Christians have been given. Just as the characters in our much-beloved fantasy story, we should keep our sharp sword near us at all times. Better yet, let us say like David, "Thy word have I hid in mine heart, that I might not sin against thee," (Psalm 119:11.) The more Scripture we have hidden in our hearts and our minds, the more we have ready for any moment, for any "battle" we may face along the road. We must also avail ourselves of our swords at the appropriate times. The Bible tells us that we will never be tempted "above that ye are able but will with the temptation also make a way to escape, that ye may be able to bear it," (1 Corinthians 10:13.) This makes me think of the temptation of the Lord Jesus in the wilderness. How did He escape these temptations? Three times the Lord Jesus spoke to Satan and said "It is written," and quoted Scripture. When we have the Word of God hidden in our hearts, when we have it in our minds, or even if we have it nearby, we can use those words as that "way to escape" in the time of temptation. Let us use our swords often and wisely, knowing that this tool, this great gift, has been given to us by our Lord to enable us to grow in the grace and knowledge of the Lord Jesus Christ. Our grandson Jackson is six. These days it seems each time I see him he has grown a foot. It is obvious looking at him now he will end up to be tall like his father and his great-grandfather. His height is in his genes. There is nothing he has done to accomplish it and nothing he can do to add even one millimeter more to his height once he has finished growing. Yet when speaking of adding"one cubit", or about 18 inches, to our height, Jesus referred to this as "that thing which is the least." I don't know about you, but I think adding a cubit, or an inch for that matter, to my height would be a pretty big deal. But I am not God. If added to our height is the least of things, how very easy for the Lord must be so many of the things we request of Him. He has already promised to ". . .supply all your need according to His riches in glory by Christ Jesus," (Philippians 4:19), which pretty much encompasses everything we could ever need. He has already ". . . raised us up together, and made us sit together in heavenly places in Christ Jesus:" (Ephesians 2:6), which puts us in the very best place we can be, regardless of where we find our earthly bodies. If something we easily recognize as totally impossible for us the Lord Jesus declares to be the "that thing which is least", it is no wonder we are told over and over again in Scriptures to cast all our cares upon Him. It is because He can handle them. There is nothing we can bring to Him that is too big for Him and nothing that can take Him by surprise. If we simply concentrate our lives on Him and His righteousness, then all the "things" -- the least and the not so least -- will be added. Sometimes when I am leaving for work in the evening, my mind is not on the job to which I am heading, but on the bed I have just left. I am reminding myself that when I return home I can climb back into my incredibly comfortable bed and sleep. On some days I actually have the luxury of sleeping as long as I would like, although I rarely take advantage of that luxury. During my night of work, my mind may return often to the thought of that comfort awaiting me in the morning. On some nights it is the sheer promise of sleep in the morning that helps me -- and my night shift co-workers -- get through our shift until we see the faces of our day shift counterparts in the morning. It is the comfort and pleasure ahead that keeps us going through the twelve hour shift. One day we were heading to the church where my husband teaches Sunday School. This church is 18.77 miles -- or 27 minutes -- from our house, and we were already running late. The first traffic light we encountered was red and stayed red. We had encountered the traffic light in the beginning of it's cycle and we sat at the intersection for about five minutes, although it seemed like fifteen. Since we were already running late, sitting still at the light was a difficult exercise in patience. I tried to remind us both that perhaps this delay was allowed by the Lord to save our lives. If we had not encountered this red traffic light we might have encountered a driver traveling at dangerous speeds instead. He is a buckler to all those that trust in Him." This is one of my favorite times of the year. The cool weather starts and we have a respite from the heat and humidity of our Southern summer. Although the majority of our trees are evergreen, the few deciduous trees we have are showing some color and the stores are sporting the signs of the upcoming holidays. The Bible says of our Lord that His "understand is infinite" and just this one simple thing, the changing of the seasons, speaks to me that it is so. How dreary I think it would be if our seasons didn't change, if the leaves didn't fall, if winter didn't come so that Spring could eventually burst forth in it's glorious beauty. My husband's favorite season is fall and experiencing it now I can understand why he loves it so much. That first breath of cool air, the crispy leaves underfoot, the fall flowers we just planted in our garden are all good reason to love the season. As for me, I love winter. I love the cold. I love to see the bare bine stems and the dormant grass. I love how there is this bleakness, everything seeming to be dead, and yet, there is great life waiting just beneath the surface. And as much as I hate the thought of the approaching hot weather, I do love Spring. I love the strong winds of March. I love seeing the new little sprouts of green on the trees and the new flowers popping up everywhere, the earth coming to life again suddenly after a long sleep. The one redeeming thing I have to say about summer is there is plenty of time for kayaking. I do not like the heat and I do not like the humidity, but it does make us welcome the change to Autumn. What if there were no changes in seasons? No Winter? No Spring? How wonderful is our Lord to give us a change of temperature, a change of scenery every few months! "O the depth of the riches both of the wisdom and knowledge of God! How unsearchable are His judgments, and His ways past finding out!" "And Not of Yourselves. . ."
When we attend the University of South Alabama football games, the players on the field often indicate to the crowd to cheer and make noise. The cheerleaders actually hold up signs that say "Make Noise." The aluminum bleachers at the stadium give great opportunity to make a lot of noise. Pounding feet, hands, even keys on these bleachers generates tons of noise and the crowd loves to do so. Whether this actually influences the outcome of the game is unknown. We certainly would never say our actions caused our team to win the game, only the actions of those players on the field can do that. In the same manner, our works -- our good deeds -- never can cause us to enter into heaven. Only the works of the Lord Jesus can do that. Our actions can never meet the standard required by God. He requires absolute perfection and until we can obtain the absolute perfection as lived by the Lord Jesus Christ, we can never be justified by our own works. Thank goodness we don't have to! Thank the Lord that in His grace and goodness He has provided a way for us, a gift for us, to enter into heaven not based on our works or merit but based on the works and merit of the Lord Jesus Christ. And all we have to do is accept that gift. How gracious and merciful is our God! we shall be saved by His life." shall reign in life by one, Jesus Christ." but the gift of God is eternal life through Jesus Christ our Lord." need that lamp the most is the exact moment the bulb decides to give up the ghost and die. I suppose if I could find a really great light bulb (that didn't require the EPA to intervene if it were to be broken) that would last say, twenty years I might buy it. If it were reasonably priced, that is. They could call it "The Endless Bulb." Think of how that would be, an "endless bulb." We all love "endless" things. When I was a young girl, someone gave my parents a huge -- and I mean H-U-G-E roll of wrapping paper. It must have been at least twelve or eighteen inches in diameter. I can still see the design of it. That's because we wrapped every Christmas present in the house in it for years and years. It wasn't until I was an older teenager that it began to run out. That roll of wrapping paper really did seem "endless", but even it eventually came to an end. Our Lord has the "power of an endless life," and to those who have believed in Him, He has given eternal life through faith in Him. Our bulb will never "blow out." We have power and hope and grace through Him. No matter how dark the night, His light will continue to shine in and through us as long as we trust Him to do so. The circumstances don't matter, all that matters is that Power coming through our bulb and the Power is the power of the Holy Spirit of the eternal God Almighty. Let us give thanks to our Lord that there is nothing in this life that can shake loose the filaments of our bulbs. Let us praise Him that there is no darkness too dark for His light and that there is nothing that can ever separate us from Him, not now nor for that eternal life He has given us. Today we as citizens of the United States of America are given the privilege to exercise our most basic -- and in my opinion, our most precious-- right of our citizenship, that is we are given the privilege to vote. Immediately I think of citizens of other countries who would love to have the privilege of participating in truly free elections. I remember the first elections held after "Iraqi Freedom." The pictures of the women proudly holding up their purple stained thumbs, the symbols of their first ever vote, brought tears to my eyes. It was especially dear to my heart as I realized it was the blood of American patriots who helped to secure the ability to vote for these women. Please take the time to vote. Our right to do so through the years has been secured and maintained by those willing to lay down their lives in defense of our Constitution. Our vote is not only a right, it is a privilege bought with their sacrifice and is something we should each treasure. There are 530,000 elected offices in the United States. Each one requires our prayerful vote. Vote for a President and Vice President, for Senators and Representatives, for Governors, State Senators and State Assembly Representatives. Vote for Mayors, Sheriffs, Judges, City Council members, School Board members and State Treasurers. Just VOTE! Someone died so you could. My husband, my oldest daughter and I were watching the Alabama-LSU football game Saturday night. My daughter is a University of Alabama alumni, so of course, you know which team we were cheering to win. As the game progressed, LSU led Alabama, and since the game was being played at LSU it seemed the home-field advantage would prevail. Things looked bleak and many Alabama fans I know actually turned off their televisions and went to bed. They missed it. In the last seconds of the game Alabama made a dramatic drive ending with the winning touchdown leaving only a few seconds on the clock. Alabama was still undefeated, my husband and I were happy and our daughter was elated. Sometimes when we look at the world around us, and how evil seems to prevail more and more, we may feel as if our enemies, and those of our Lord, are winning. Perhaps we feel they have too great a "home field advantage." But don't be discouraged, the battle is not yet over. As the old hymn says..."Jesus who died shall be satisfied...God is the ruler yet." The day will come when every knee will bow to the Lord Jesus Christ and confess Him to be "Lord of Lords and King of Kings." We shall all be there. We will either be those who are joyfully entering that chorus, or we will be those who are tearfully entering that chorus. But make no mistake about it, our Lord had already told us, "I have overcome the world."